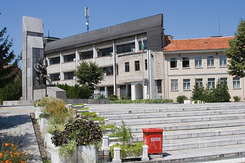 Gotse Delchev Town in Bulgaria. Information and Bookings. Location: Gotse Delchev is situated in Gotse Delchev Valley, at the South-Eastern foot of Midlle Pirin Mountain. It is 212 km away from Sofia, 50 km south of Bansko and only 20 km north of the border with the Republic of Greece. The city bears the name of the Bulgarian revolutionary Gotse Delchev. Until 1951 the city had the name Nevrokop. History: Nevrokop initially originated in proximity to the ancient city of Nikopolis ad Mestom, whose ruins may still be seen 9 km east of the city. Notitiae Episcopatum mentions the city as a center of the arch-bishops until 11th century. Near the contemporary city of Nevrokop were found the remains of a fortress and a settlement, dating back to 9th-10th century, which are considered to be the immediate ancestors of the contemporary city. 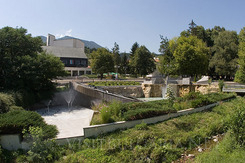 Sightseeing: With its colorful houses, green gardens and flower alleys along the streets, Gotse Delchev resembles a cradle tied to granite peaks of Pirin. The city is rich with its historical past, the spiritual generosity of the local people, with the warm southern sun and its fertile land. The archeologists date the flint instruments found near the city park, back to the neolith. They also found the foundations of Thracian settlements and tombs, beautiful copper helmets and colorful mosaics of early-Christian basilicas. Plinius the Elder tells about the life of the Thracian tribe of Bessi, which used to live in the lands around Mesta river, and the scientists are still seeking in these lands the traces of the legendary Orpheus. The region is one of the richest in waters and forests in Bulgaria. Numerous circus lakes on the north-eastern slopes of Pirin, pouring their water in the tributaries of the Mesta river. Particularly beautiful are Breznik, Kornishky and Kamenishy lakes. 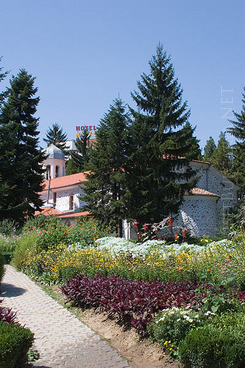 The mineral waters are abundant, springing at the foot of the mountains. 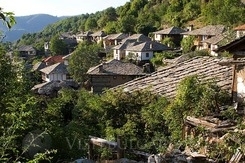 Vicinities: 17 km away from Gotse Delchev is the old-time village of Leshten, which is also an architectural reserve. 27 km away is the architectural monument of the Kovachevitsa village. Overlooking the very city of Gotse Delchev is the village of Delchevo, perched over steep slopes, it offers breath-taking sights. The village is located in the very beech forest; enjoying limpid, sweet water and bird’s view over the entire valley of Gotse Delchev.